Order your Pelikan Edelstein Bottle Ink today from FahrneysPens.com. Fine Pens, Refills & Luxurious Gifts – great prices & fast shipping. Add a touch of sparkle to your words with Pelikan's line of Edelstein Bottle Inks. The word Edelstein translates as gemstone, which is fitting as each ink color represents a gem! Edelstein Bottle Ink is like having a gemstone on your desk. 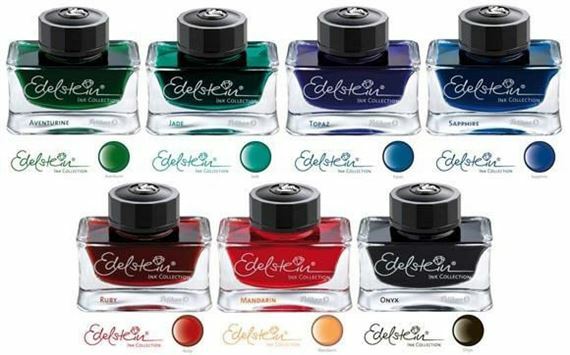 All seven brilliant colors in the Edelstein Bottle Ink collection are made with a special ingredient that ensures extra-smooth writing and ink flow. The unique glass flacon looks beautiful on any desk. Edelstein ink comes to you in a 50ml bottle. Sapphire actually turned out to be purple instead of blue. As purple ink it flows and writes well.